When Meryl Streep portrayed Julia Child in the film Julie and Julia last year, Americans rediscovered French cooking. A few weeks after the movie premiered in August 2009, and 48 years after it was first published, Child’s Mastering the Art of French Cooking landed in the No. 1 spot on the New York Times bestseller list and beouf bourguignon was back in vogue. 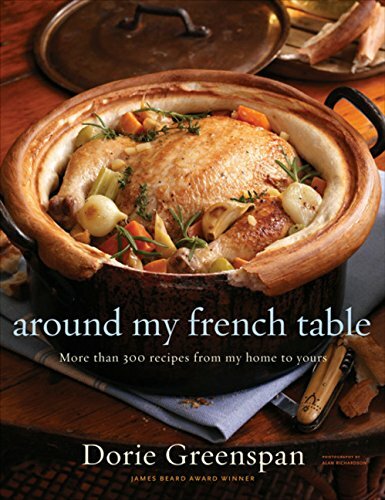 Now that we are taking another look at French home cooking, maybe its time to update our recipes as well. In Around My French Table, Dorie Greenspan, who lives in Paris part of the year, gives a fresh interpretation of French food and how it is being cooked today. It’s not Julia Child’s Paris anymore. The book is positively chock full of delightful new interpretations on old classics as well as a few surprising new recipes. In her version of lentil soup, for example, (lentils being a fixture of home cooking in France), Greenspan starts with the basic recipe of onion, celery, carrots and lentils and then adds minced ginger, coriander seeds and orange peel, which really liven up this tried and true standby. Ginger and orange zest are also used in her braised short rib recipe, adding both zing and brightness to an otherwise traditionally heavy dish. In fact, Greenspan offers quite a few recipes use ginger and Asian spices, as if to say that even in France cooking has become more global. One of the best chapters (they are all good, but this one is especially so) is the chapter “nibbles and hors d’oeuvres.” If you read through the chapter you will learn that in Paris (and France generally), you don’t need to offer much in the way of nibbles with your aperitif before dinner. In Paris, the most often served hors d’oeuvres are usually some nuts, olives, and something a little crunchy or cheesy like “cheez-it-ish crackers” or “mustard batons.” This is such a welcome relief for all those hosts who tend to go overboard with their appetizer spreads and end up ruining the appetite of their guests for the main course. Let’s all take a pledge to become more like the French, and stop the appetizer madness. Dorie Greenspan is one of those Americans like Julia Child, Alice Waters, and others whose first trip to France and the food she ate changed the course of her life. By now we all know that for Julia Child it was her meal of sole meunière that initially hooked her. For Dorie Greenspan it was a strawberry tartlet that made her rethink her life and shift from gerontology to cooking and food writing. She has enjoyed a long and distinguished career working on projects with food luminaries such as Julia Child, Pierre Hermé, and Daniel Boulud, and has authored a few cookbooks of her own. Her work should be better known because she is one of those rare cookbook authors who has the ability to draw you into her cooking world and make you feel as though you are in her kitchen right along side her. Having so warmly introduced us to Alice and explaining that “speculoos” is a spice cookie particular to Belgium and northern France makes this dish almost irresistible. You can tell all your friends that the recipe comes straight from Paris and they will think that combining cookies and chicken is the height of sophistication. Child, who died in 2003, can never be replaced, but if she had been able to name a successor as a standard bearer for French home cooking in America she probably would have named Dorie Greenspan.